A while back I posted the above photo of 800 oz of breast milk I pumped while Dash was in the hospital and I've had quite a few questions about how I did it. First, I don't have a generous supply naturally. With Dollie I pumped maybe 3 times total out of the 14 months I nursed her. I had enough milk to nurse her for those 14 months but definitely not any excess. So when we found out that Dash would be in the NICU for weeks on end without a end date in site the lactation specialists helped me get my supply going. I wanted to share with you some of the tips they gave me. They are pro's you guys! I nursed Dash for the first 2 days of his life before he got sick and started to not hold down my milk. When he was 3 days old I started pumping just to get some relief, not knowing if he would even live to drink it. On day 5, once we knew he was going to be okay, is when I started a strict pumping regimen per the instruction of lactation. 2. Pump for 15 minutes no matter what for the first few days, even if milk stops dripping after just a few min keep going until you hit the 15 min mark. 3. Adjust the pump pace and suction to match the way a baby would nurse- fast and light for the first couple minutes then slow, longer and stronger suction for the remainder. 4. You should pump about an oz per hour. So 3 oz every 3 hrs. I did these things religiously and after just a few days my supply was really coming in. I was able to pump enough that I no longer needed to pump for the full 15 min. I was getting lots more than the 1 oz per hour rule. Lactation continued to check with me to see my progress and by day 14 I was pumping upwards of 35+ oz a day. At that point they told me to stay there and not build anymore so I continued to pump every 3 hours during the day, and then spread out the nights between 4-5 hours. A typical day would look like this: 7am, 10am, 1pm, 4pm, 7pm, 10pm, 2am, 7am, etc... I was able to pump 6-8 oz in 5 min. It was great! Dash was finally able to start nursing after a few weeks but only occasionally and nothing consistent so I kept on pumping. 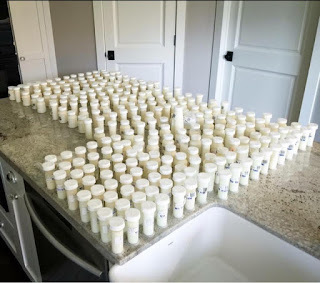 They did start giving him my milk more often by way of bottles so even though I counted 800 oz in my freezer I have no doubt that I pumped over 1,000. I definitely had to work for it and really commit to it. It wasn't always convenient. I also had to rent and pay for my hospital grade pump. I think it was $30 per month and I had it for 2 months. Some of the NICU nurses told me that they rent one when they have babies for the first month just to really get their supply going. I am definitely going to do the same for my future babies. Recently, I drastically changed my diet and started eating a lot healthier and my milk supply started to really go down. It was enough for me to notice, and it was really making me nervous. 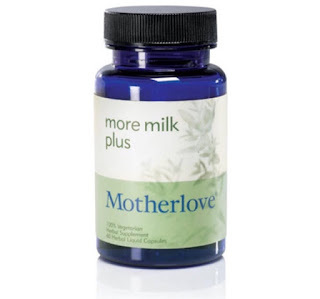 I want to nurse Dash for at least a year so I found this incredible supplement by Motherlove and it's called More Milk Plus capsules. It contains fenugreek seed, blessed thistle herb, nettle herb, and fennel seed- all things that have been proven to help build moms milk supply. You can get it at most health food stores and you can read more about it here I have been taking it for the past 5 days and am noticing quite a difference in my supply already. I am at ease, to say the least. One other important thing worth mentioning: once we got Dash home from the hospital, after 5 long weeks, we wanted to start making some sort of dent in my pumped milk, while keeping my actual supply going. We started with the oldest pumped milk and he did not want it at all. It had a really weird smell and taste. I called lactation and they explained to me that my milk most likely had high lipase. 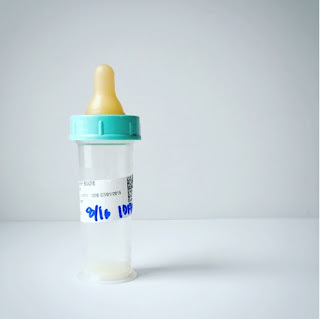 Lipase is an enzyme found in human milk that is very beneficial in many different ways, but some women have an excess of the lipase enzyme which begins to break down the milk fat soon after you pump, which is totally fine as long as your baby doesn't mind the odd taste. Well, Dash does mind it. Unfortunately, due to the lipase, Dash really has not liked the pumped milk. The only way to get around it is if you already know your milk has it beforehand and then you can immediately scald your milk after pumping, and then freeze it. Wish I would have known!! All my milk went directly from me into either my freezer or the NICU freezer within minutes, but it has a pretty strong taste/smell that Dash just has not cared for. I have donated nearly all but 200 oz of the 800. Luckily, some babies have liked it! It's been a bit hard for me because I have a a big emotional attachment to it, but I've been able to donate to 3 different women who have had babies in great need. We have about 50 oz left out of the 200 that Dash is seeming to do okay with. Not sure if it's because he's just older or what but I am so glad he is getting some of the milk I worked so, so hard for. I love looking at the dates and times on the bottles while he's eating and thinking back to those moments when I sat alone in the little pump room behind the curtain just pumping away. Our bodies are truly incredible and I have learned so much more about the importance of breast milk. Did you know that when your baby nurses saliva sneaks out of their mouth and enters your body, and your body basically reads the saliva signals and then responds to exactly what your baby needs and then begins making it for your baby to drink? So if your baby is getting sick then his/her saliva will enter you and your body will begin making the exact antibodies that fight the specific infection and will help your baby get better faster and not as sick. It's like their own personalized medication that literally cannot be duplicated any other way. Truly special! You need to read more about that and other extremely mind blowing information about breast milk here Some women just simply can't breastfeed for various reasons and that's okay! But if you can then do. Don't give up. Getting your supply up and running for as long as possible is worth all the effort, the hard work, and the time. If you don't believe me then read that article!!! Anyway, I hope this information helps some of you and if you have any questions at all please ask away! Happy pumping! Thanks a lot very much for the high quality and results-oriented help.I won’t think twice to endorse your blog post to anybody who wants and needs support about this area.